An improved version of the well-known Erase Pro. Regulates the endocrine system, reduces unwanted cortisol. Hardenes and favourably "sears" muscles. Promotes the growth of lean body mass and fat burning. Increases testosterone level and improves libido. Neutralizes negative effects of stress. Increases the efficiency of the body on the physical and mental effort. Erase Pro + is a scientifically innovative formula, addressed to experienced athletes looking for a product that will give the finishing touch of their hard-earned silhouette. This supplement "hits" the most undesirable and unwanted catabolic hormone - cortisol. It is a hormone that usually increases the concentration under physilac stress, wreaking havoc in the body. Cortisol temporarily increases athleticism, then suddenly weakens it, destroys muscles and causes the assumption of fat and subcutaneous water. Bodybuilders are trying to reduce the level of cortisol very hard. Erase Pro + helps in this brilliantly. The main component of Erase Pro + is an extract from the root of Ashwagandha (675 mg) under the name of KSM-66®, completed withe the composition of other herbs. Ashwagandha roots are also called Indian ginseng, and their action are considered by many scientists to be more powerful than the Chinese ginseng. This herb improves the functioning of the immune system, has anti-aging properties, a positive effect on the nutrition of tissues - especially muscles and bones. It also has calming properties, works anti-stress and improves sleep very well. It regulates the functioning of the reproductive system, increases libido. In addition, it still has a very important effect - reduces the level of cortisol and normalizes other hormones. Its effectiveness has been proven scientifically. 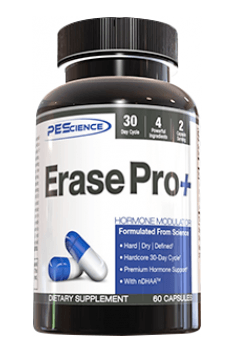 Erase Pro + has a natural origin, using it does not cause any side effects in contrast to other synthetic cortisol lowering supplements (eg. 11-OXO). Erase Pro + is an excellent supplement to "finish" a good shape - both before the competition, and before going to the beach. Rather, it is recommended to experienced athletes, who can fully enjoy its advantages and possibilities. Take 2 capsules a day with the first meal. The optimal period of use should range from 4-8 weeks. The location of portions after the first meal should work best, thanks to additional properties elevating mood and lowering stress during the day. Gelatin, Magnesium Stearate, Silicon Dioxide, FD&C Blue #1, Titanium Dioxide.